Growing up my sister, Becky and I were so close. We are still very close. I have two sisters and I am the middle child, wasn't always fun being the middle child. What the oldest was given and abused was not offered to me and by the time the youngest came around it was all forgotten. So I paid for my older sister's bad behavior. That is OK, I love her anyway. My youngest sister Becky has been the most supportive of my blogging endeavors. She has been there for me from the beginning. She is the one who helped me get my own domain name and get this off the ground. She is the one I call on to change my header or do any technical stuff that I have no idea how to do, which is pretty much everything! I think I have started to rub off her her a little. She is doing more cooking from scratch and making things I had not even attempted. She has her hands full with two growing boys, one is six and the other is four. She also takes care of my daughter for me while I am working. I do not know what I would do without her. Just today when I picked my daughter up, she offered me a glass of cherry limeade and we sat outside and chilled a little. I so needed a little down time, even if it was just a few minutes. I think she probably needed it just as much as I did. We are not only sister's, she is my best friend. I love ya Becky! I have not tried these yet although I have heard her rave about them for some time now. I will have to try them soon. Thanks for sharing Becky! 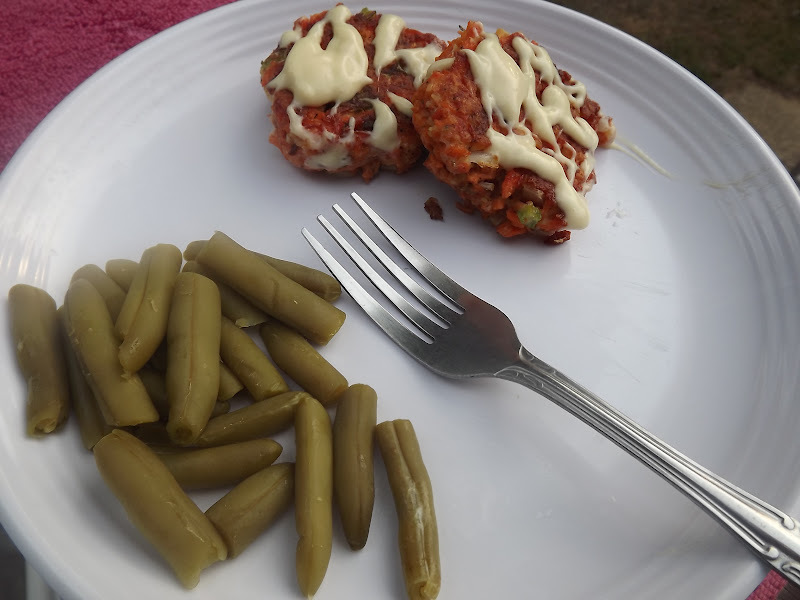 I started making these when my husband was asking me to make “healthier” meals for him. He had a heart attack in 2008 and keeps asking me to find healthy foods for him. I find this very challenging and at times difficult since our two young boys are just as picky as their father! But, hey, I try! That counts for something in my book. I’m not a big fish eater myself and so this recipe is really my way of getting myself to eat fish! I found this recipe in The New Cook Book at my mom’s house. She was with me the first time I ever made or ate salmon patties. Together we put this recipe in action! I’ve tweaked it along the way as we all tend to do. We want to make each recipe “our own” and that’s what I’ve done. I hope you try these and find them delicious and a great way to eat salmon! Make sure you make the sauce to go with your patties, it truly brings out the flavor and gives it that extra umph! 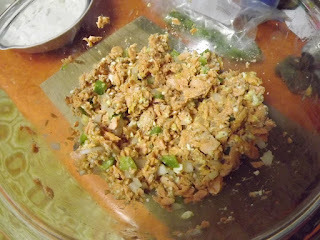 Place the salmon filet into a small baking dish and add a little water, enough so it doesn’t burn or get dry. Use salt and pepper to desired and Old Bay Seasoning. I don’t really measure this so you can adjust seasonings to your liking. Bake in oven on 350 for about 20 minutes or until salmon is cooked and flaky. The meat will flake off the skin and add to a mixing bowl. 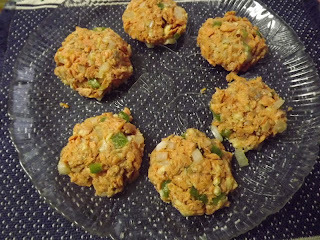 Add diced green peppers, diced onions, bread crumbs and 1 egg. Again, you will add as much or as little you like. I’d say a quarter of an onion and a quarter of an pepper. Mix the ingredients and form into patties. Place the patties on the skillet and fry until crispy. Mix about two tablespoons of mayonnaise and about two tablespoons of honey mustard and mix together.